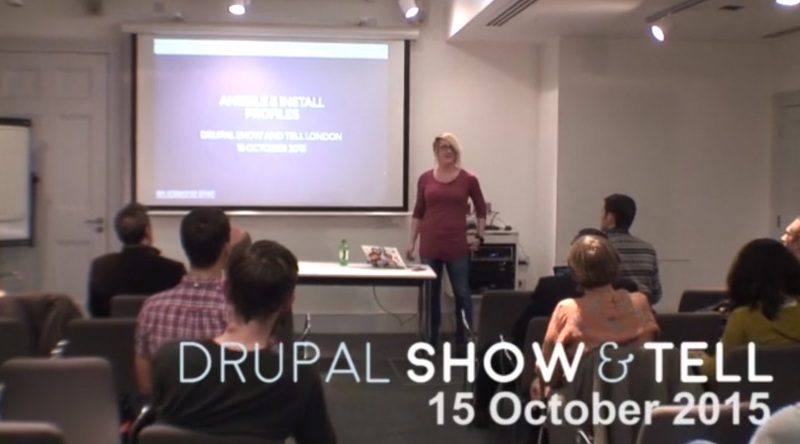 Back in October the nice folks who run Drupal Show & Tell invited me to do a talk up in London at one of their upcoming events. I was just in the process of finishing up a project where I was using Ansible alongside my Drupal development of a custom install profile, so I thought I'd do my Ansible and Install Profiles talk that I originally did at DrupalCamp North. The talk goes into details of how I used Ansible to build and continuously rebuild the install profile I was working on, how Ansible helped me to migrate data from an old Drupal 6 site, and to even deploy and maintain the site once it went live. I've done a lot with Ansible over the past year and now I can't imagine my work without it, this project was a great example of that. While Ansible is often thought of as a configuration management tool, I've been using it to script out just about anything I can these days. The talk also discusses the benefits of building a website as a custom Drupal install profile. Install profiles give you the ability to completely trash and rebuild a website and always have it go back to it's originally configured state. And while many people use install profiles, or distributions, as starting points for their projects, it can often be quite beneficial to create custom install profiles for client sites as well. Big thanks to the organisers, speakers and Cameron & Wilding.